Specially formulated table and bed roll conveyor covers designed to minimize urethane shaving from lead edges and sharp edges. Coverings are formulated for heavy abuse in the looping conveyor area. Custom conveyor coverings to any size diameter and face length. Diameters can be made to odd sizes or cast finished to standard diameters. Custom molded urethane parts for all industries. Urethane offers superior life to rubber. 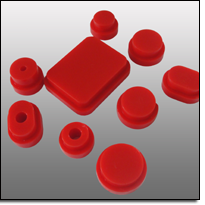 Urethane molded parts can be custom made to any customers needs. Urethane stabilizer used in the oil drilling industries .Universal Urethane can make your key drilling parts by reverse engineering your existing part. No prints are required. Universal Urethane uses a specially blended material to hold up to the toughest applications. 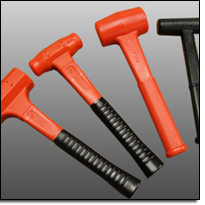 Custom molded urethane hammers and mallets for all industries. The urethane offers a non-sparking head and superior life to rubber hammers and mallets. Urethane covered muller wheels extend the life of the muller wheel by having the urethane in contact with sand instead of the steel muller wheel. Urethane coverings are abrasive resistant and can be refurbished when worn. Urethane covered blade rolls for the fiberglass chopping industry. These rolls are inexpensive and have a quick turnaround for recovering. Any spacing can be made. Urethane saddles to hold work rolls. Saddles safely hold all sizes of work rolls. Work rolls will not move or be damaged during storage. Urethane filler sleeves and expander rings used to quickly buildup any reel to another diameter. Available with gripper bar slots if needed. Urethane segments for adapting mandrel segments to larger sizes. Urethane segments will not chip or break like plastic. 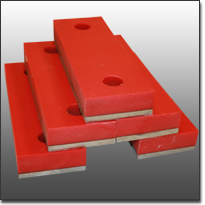 Urethane segments are custom made to fit any mandrel size and shape. Zero-thane snow plow blades have higher abrasion resistance than rubber blades. Zero-thane snowplow blades are made in custom sizes and standard sizes. Zero-Thane products set the highest standards for performance in the snow removal industry, offering exceptional service life in the harshest conditions. Designed to combat unnecessary downtime and maintenance, Zero-Thane’s specially-formulated polyurethane is site-tested to withstand temperatures to -30º below zero and is proven to outlast steel, rubber and plastic alternatives. 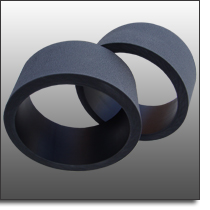 Urethane slitter rings are oil and cut resistant for increased life without swelling. Rings can be custom made in any durometer or color. UUP can manufacture complete or strip and recover existing cores. Specially formulated material designed to handle very high loads without damage to the urethane covering and the urethane bond to steel core. Urethane bridle rolls offering a wide range of durometers and surface finishes to achieve the highest co-efficient of friction with the best roll life. Urethane plates with steel backing. The steel can have a border for welded attachment or countersunk bolt holes for bolt attachment. Urethane turn style pads with steel backing. The steel can have a border for welded attachment or countersunk bolt holes for bolt attachment. Custom conveyor "V" roll for steel pipe and tube industry. We can make covering bonded to metal core or in the form of a sleeve for field installation. Urethane V-rolls are designed to be slid over a steel core. These rolls can be kept in stock and the covering can be quickly changed.